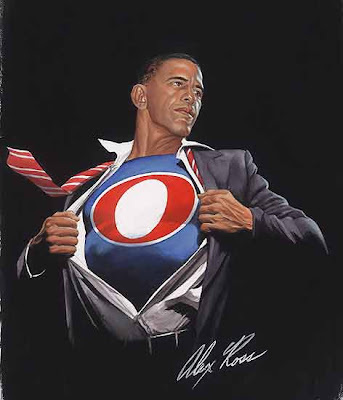 For more political images from Ross -- along with some of his more traditional superheroic work -- see the "Alex Ross: Political Muckracler" post at the Are You a Serious Comic Book Reader? 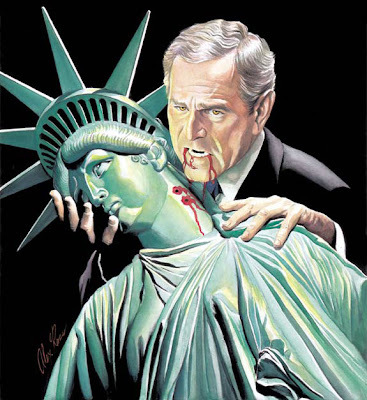 blog, and visit Alex Ross' official site at AlexRossArt.com. In the U.S. the wealthiest 5% of Americans own nearly 60% of the nation's wealth. The top 20% own around 80% of the nation's wealth. Although there have always been rich and poor, the distribution of overall wealth has changed dramatically in the past 30 years, with the distribution of wealth becoming increasingly top heavy. If the pattern continues, the middle class will cease to exist; there will just be the rich, and the people who work for the rich at whatever rate the rich feel like providing. Across the U.S., companies are freezing raises, freezing new hires, hiring on new employees at lower rates than the laid off employees they're replacing, mandating capped raises that barely match inflation (say, 2% raises per employee, even for good performance), cancelling pension plans, canceling matching 401k payments, breaking unions, lowering commisions, reducing health benefits, and outsourcing jobs to foreign lands -- while at the same time the top executives have seen their salaries increase by hundreds and hundreds of percentage points over the last few decades. And the big banks are getting bailed out while millions of Americans are losing their homes and jobs. The U.S. government takes out loans from China in order to pay for a war where Halliburton & Co. execs profits but average Americans see no benefits (and, eventually, somebody is going to have to pay for this war -- it's not a question of whether the war was right or wrong, it's a question of when we're going to actually pay back the debt). The oil companies are making record profits while Americans pay more at the pump. With all of that in mind, you'd think that 80% to 95% of Americans would be up-and-arms, demanding at least moderate redistribution of wealth. Not Harrison Bergeron everyone-must-be-totally-equal territory; but at least some good old fashion American modestly-tax-the-rich leveling of the playing field. Actually, that sounds more like how the GOP has been handling our hard-earned money -- giving tax breaks to profitable coporations and the super-wealthy, paying billions of dollars to various Military-Industrial-Complex contractors. Obama's tax plan, on the other hand -- despite what you might think after hearing some of the more "controversial" O-man quotes trumpeted by the GOP -- essentially just calls for a repeal of the pro-rich Bush tax cuts on those making over $250,000 a year, while closing some corporate tax breaks and introducing new tax breaks for the middle class and the poor. Even if you are rich, these changes to the tax code are not going to dramatically effect your lifestyle; just get used to paying the same kind of taxes that you had no trouble paying 10 years ago. No big deal; it's not even that revolutionary, just a modest and fair adjustment to the current tax code.. Still, realistically, more taxes are going to be needed at some point -- to pay off the war debt, to pay off the debt from the financial bailout, to pay for new infrastructure to keep our roads and bridges and railways and energy system from falling into pieces. Nobody likes to pay more taxes; but, then again, nobody likes paying down their credit card debt, either. However, it has to be done. Modestly taxing the richest 5% of Americans isn't a bad way to start; an oil windfall-profits tax wouldn't be a bad idea either (note that even Partisan-Tactics Palin supported a windfall-profits tax scheme in Alaska). 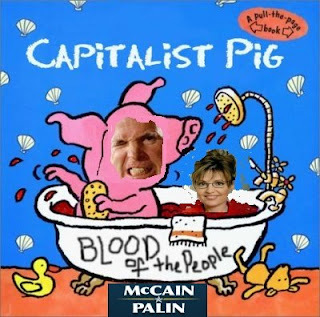 Bush and his neoconservative pals have nearly destroyed the world economy; McMaverick is more of the same. It's time to give some new folks a shot. Vote Democrat or Independent. And just for fun, turn up the volume on your computer and then click around PalinAsPresident.us.